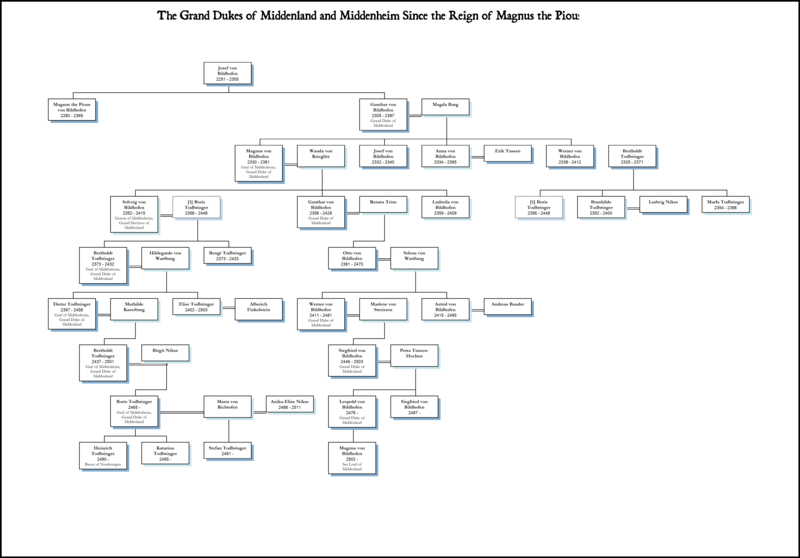 As an adjunct to the Imperial Almanack project I have completed a number of family trees for each province. The original intention here was to explain and illustrate some of the more complicated dynastic politics, especially since some of the provinces appear to have changed hands recently. Having finally worked out how to get the software to produce viewable reports, I'll present the first few for your examination. Notes below. N.B. Spoilers for Swords of the Emperor and (minor) spoilers for the WFRP adventure Forges of Nuln in the Leitdorf tree. 1. 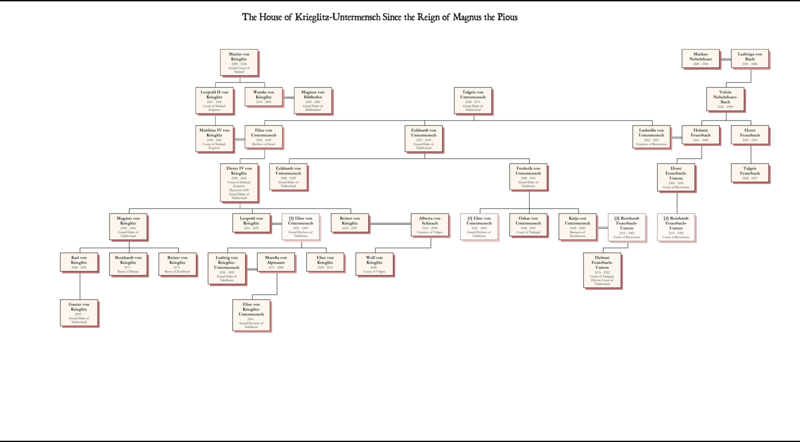 This was relatively straightforward thanks to information from WFRP1, Sigmar's Heirs and other sources. I've opted to treat the reference to "Wilhelm II" in Van Horstmann as a typo, given that that Emperor is traditionally Wilhelm III, and instead start the "House of the Second Wilhelm" from his grandfather. I've used Alfred Nunez's article indicating that Wilhelm's adoption by Magnus. 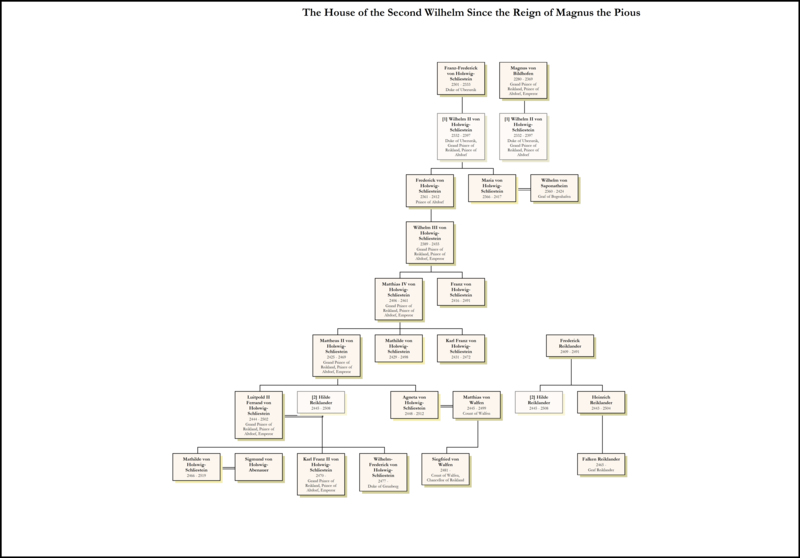 Wilhelm's successors Matthias IV and Mattheus II are referenced in WFRP material. The Emperor's cousins Siegfried von Walfen and Falken Reiklander are mentioned in both The Enemy Within and Sigmar's Heirs. His nephew and heir apparent Wolfgang Holswig-Abenauer is featured in The Enemy Within, and their relative ages suggest he is the product of an older rather than a younger sibling (therefore presumably a sister, unless KF had an older brother who died before 2502, which has never before been mentioned). His brother is mentioned, though not by name, in Grey Seer, while his son Luitpold is in Drachenfels and Beasts in Velvet. 2. This was by far the easiest for me, since GW have already given us a Todbringer family tree in Warhammer City. A couple of adjustments were necessary to bring it up to date. 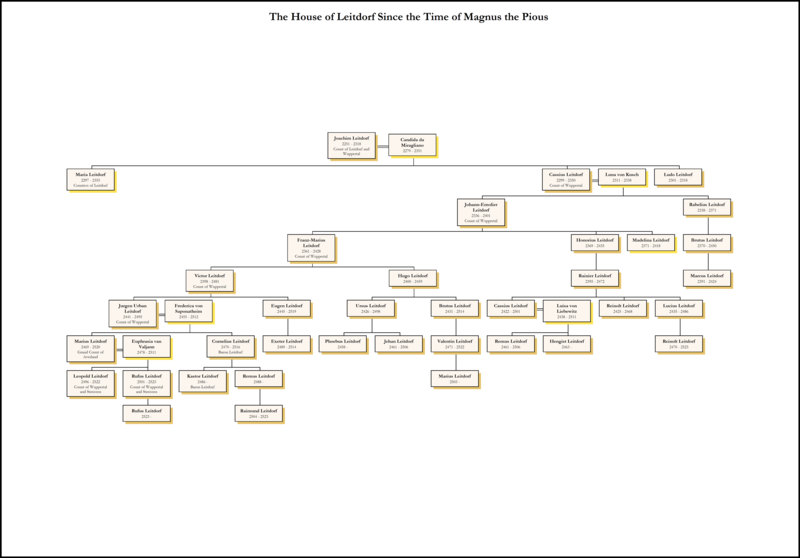 I've added in a father for Magnus and Leopold von Bildhofen and likewise on the Todbringer side, and fudged a couple of the titles. In light of changes made to the setting and the moving forward of the timeline, I've made both Boris Todbringer and Leopold von Bildhofen ten years younger so that they're a more realistic age. I've also added in Leopold's son Magnus, from Shades of Empire. 3. This was a nightmare! There's a wealth of contradictory information on Talabecland and some of the clarifying stuff just muddies it up more. I've retained much of it, although name changes for the newer editions have meant a couple of details have needed to be changed. The idea here is that the legitimate line descends through the Untermensches and their Krieglitz branch, but that Helmut Feuerbach, who has an independent claim from the Nebelsfeuer descent as well as his Untermensch ancestry, took power on the deaths of the previous rulers since their heirs were too young. I've opted to retain the Untermensch name for the sake of familiarity, although for reasons of taste I do prefer the sanitised "Untern" one in Sigmar's Heirs and am still considering a switch. 4. I've dealt with the Leitdorfs separately from the Alptraums, who I'll do on another occasion. Marius is obviously well-attested. His sons Leopold and Rufus are from Swords of the Emperor, as is Rufus's young son. His nephew Kastor, and his nephew Raimund, are from A Brutal Finish in Realms of Sorcery II. Reinolt features briefly in Forges of Nuln. All other names are my invention; I might have got a bit carried away with the references and in-jokes, for which I make only a token apology.